Space shuttle Discovery stands on the launch pad at NASA's Kennedy Space Center Friday morning as a tanking test begins. The wires in this image lead to some of the 89 strain gauges and thermocouples installed on the external tank for the test. HOUSTON ? 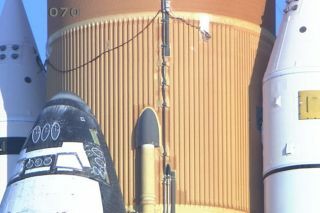 NASA pumped hundreds of thousands of gallons of super-coldpropellants into space shuttle Discovery's external fuel tank Friday morning totest why it had developed cracks along two support beams during a launchattempt last month. The so-called "tankingtest" got underway at 7 a.m. EST (1200 GMT), when the three-hourfueling process began. It is scheduled to continue until 2:25 p.m. EST (1925GMT) when the test's simulated launch countdown ends after a five-minute holdat the T-minus 31 second mark. Sensors installed on the tank will continue to collect dataas the tank is emptied this afternoon and then continue to record the tank'sperformance through Saturday as it warms to ambient temperature. The test, which also serves to verify the repairstechnicians made to the 154-foot tall tank, was proceeding without anynoticeable issues. Results from the test were not expected immediately. ?Managers and engineers will review the data generated by the exercise beforedetermining the next course of action. "It looks like we're getting good data," said MikeMoses, NASA's space shuttle launch integration manager at the Kennedy Space Centerin Cape Canaveral, Fla. "Like anything with a hazardous operation, it isnice and boring today, which is a good thing. Everything is looking like it issupposed to." Discovery willlaunch no earlier than Feb. 3, 2011 on its final flight to space beforebeing retired. But first, the shuttle will be rolled off its launch pad andreturned to the 52-story tall Vehicle Assembly Building (VAB) to undergofurther tank inspections. Friday's tanking test will help shuttle engineers determinewhat caused two 21-foot-long, U-shaped aluminum brackets, called stringers, tocrack during the lead-up to a Nov. 5 attempt to launch Discovery on its STS-133mission. That launch attempt was called off not because of the cracks butrather due to an unrelated gaseous hydrogen leak that emanated from a cableconnecting the tank to the pad. The hydrogen leak was subsequently traced back to a hardwarealignment issue and was corrected. During Friday's test, no hydrogen wasdetected escaping from the umbilical. In February 2003, falling foam from the fuel tank hit thespace shuttle Columbia's left wing, damaging its leading edge. The impactultimately led to the loss of the vehicle and its seven-person crew whenColumbia re-entered Earth's atmosphere at the conclusion of its STS-107mission. Though NASA has encountered cracks in a tank's stringersbefore, they have always shown up during its assembly. This was the first timethat cracks were found while the space shuttle was on the launch pad, leadingengineers to wonder if they missed something during the beams' fabrication orinstallation. "Either the stringer was the cause of the problem, thatthere was some assembly tolerance, some build up of stress in that part, or acrack that went through the system and we didn't see, that caused this stringerto break and so it is an isolated event ? it's this stringer and that's theproblem ? or the... stringer is a victim here and the design has a problem, thetank itself has a bigger issue to it, the loading had a problem and that thereis something wrong generically that is causing stress to be concentrated inthis area that's never been there before," explained Moses. Because engineers have not yet discovered the root cause forthe damage, managers called for Friday's tanking test to gather more data. Shuttle technicians outfitted the tank's ribbed midsection,or intertank region, with nearly 90 instruments, including strain gauges toprecisely record movement and temperatures as the tank chilled and warmed againduring the test's fuel loading and emptying process.? The orange-brown tank holds more than 500,000 gallons ofsuper-cold liquid oxygen at minus 297 degrees Fahrenheit and liquid hydrogen atminus 423 degrees F. Earlier measurements have shown that these cryogenicpropellants cause the tank to shrink by about half an inch. "The point of the [test] is to gather performance dataon the tank," Moses said. "We have stringers instrumented in therepair area so we can look and see how the repair performs under a cryo load.We have stringers instrumented next to that repair that aren't damaged, so wecan see how they perform... and then on the opposite side of the tank, we'veinstrumented stringers to kind of go to a control-type theory, to say over herein a completely different area, here's how the tank performs." According to Moses, the test will generate more than five orsix terabytes ? 5,000 to 6,000 gigabytes ? of data. "All of that is going to be post-processed and shippedto the Michoud Assembly Facility [in Louisiana] and Marshall Space FlightCenter [in Alabama] where the analysis will be done," said Moses. "Thatdata will be there tonight. The expectation is by the weekend, we'll havereviewed all of that." The data needs to be verified, though not analyzed, before Discoverycan be rolled back to its assembly hangar for further analysis and to beprepared for launch. "We've decided to roll back to the VAB and so one ofthe go-no go's for that rollback is a report from that instrumentation teamthat they are happy with the data. That doesn't mean we've analyzed it and theresults of the data are good but that we've captured good data," Mosesexplained. "We can then cut the wiring and de-configure the vehicleand be ready to rollback," he said. Discovery is tentatively scheduled to begin its 3.4 mile(5.5 km) journey back to the VAB just after midnight on Tuesday, Dec. 21. Onceinside the building, the fuel tank will undergo X-ray scans to examine thestringers along its backside.? The tanking test instrumentation will also beremoved, and ? along with the installation of any modifications called for bythe test data ? the tank will be readied again for launch. Meanwhile, shuttle managers will begin seeing the resultsfrom the test. "Our big picture plan is that on Monday, Tuesday,Wednesday next week we'll start to get the results of that data in," saidMoses. "It is going to take a while before we get all the fine details,but the big picture... all that's going to happen next week." If all proceeds smoothly, Discovery will be returned to thelaunch pad in mid-January. "We're going to have folks working around the countryright through the Christmas holiday here to be ready to potentially fly againin this February launch window when it comes around," said Moses. Discovery's next opportunity to embark on its 39th and finalmission is scheduled for no earlier than 1:37 a.m. EST (0637 GMT) on Feb. 3.The shuttle's planned 11-day trip will deliver a storage room and Robonaut 2, ahumanoid robot, to the International Space Station. Two spacewalks are alsoplanned. Editor's note: This article was updated to correct the number of gallons of fuel that were loaded into Discovery's tank.